Have you been using Envira but for the time being, you don’t need to use it? We understand. It sadly happens to the best of us. This guide will show you how you can cancel your subscription with Envira. What Does “Cancel My Subscription” Mean? Once unsubscribed, how can I re-subscribe to Envira? Why don’t I have a ‘Cancel Subscription’ option in my account? I’ve cancelled my subscription, why haven’t I received a refund yet? Envira licenses are subscription based and therefore will automatically renew each year. When you choose to cancel your subscription that doesn’t mean your galleries or albums will stop working. When you cancel your subscription, you’ll have access to support and updates through your paid term but your license will not auto-renew. 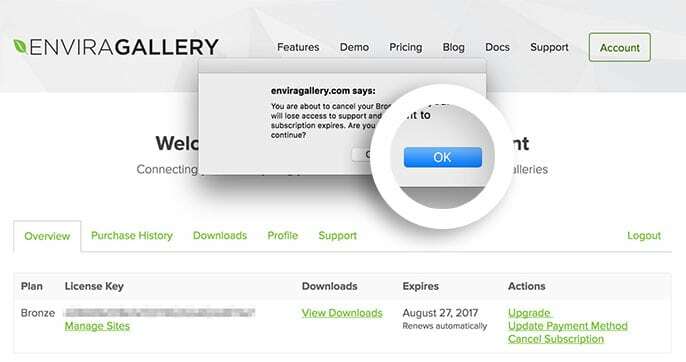 Cancelling your Envira subscription is very easy and can be accomplished in just 2 steps! First, login to your Enivra Account. Once logged-in, select the Cancel Subscription link from the Actions column of your Member’s Area Dashboard. Immediately after, an alert box will popup asking you to confirm your cancellation. THIS ACTION CANNOT BE UNDONE! Be sure to select the OK button only if you’re certain you wish to cancel your subscription. That’s it! Your subscription is cancelled and your license will not be auto-renewed at the end of its current term. Q: Once unsubscribed, how can I re-subscribe to Envira? A: When you decide to come back to Envira, just log back into your account, pay for your subscription from within your account, and you’ll again have access to support and updates! Q: Why don’t I have a ‘Cancel Subscription’ option in my account? A: If you purchased before June 2016 your license is not a subscription and will not be auto-renewed. Your license will naturally expire at the end of its current term if you don’t manually renew it. Q: I’ve cancelled my subscription, why haven’t I received a refund yet? A: If you are within our 14-day money back refund guarantee period, cancelling your subscription does not automatically process a refund. 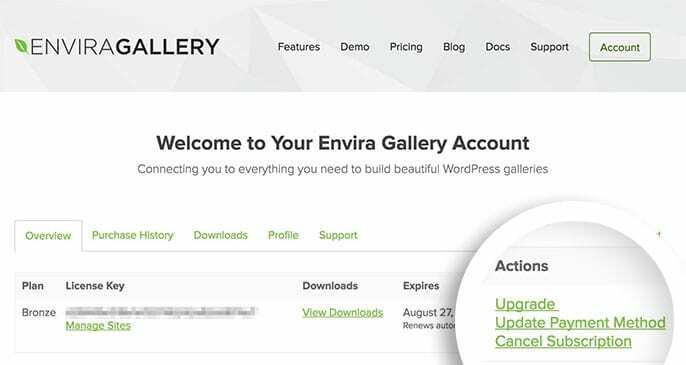 If you are looking for a refund and you are within your first 14 days of purchase, please contact support to request your refund here: https://enviragallery.com/contact/.